Is This How The Trump Administration Might Save Coal? Energy Secretary Rick Perry says subsidizing coal and nuclear power plants would make the grid more reliable. An unlikely array of critics say the move is expensive and unnecessary. Coal stockpiled at a power plant. On Capitol Hill Thursday, Energy Secretary Rick Perry defended a controversial proposal to subsidize coal and nuclear power plants. "There's no such thing as a free market in energy," he said in testimony before the House Energy and Commerce Committee. "Governments are picking winners and losers every day." It was a remarkable statement, coming days after EPA Administrator Scott Pruitt derided such tipping of the scales as he moved to repeal the Obama-era Clean Power Plan. Perry announced his Grid Resiliency Pricing Rule proposal in a notice sent at the end of September to the Federal Energy Regulatory Commission. It suggests that to ensure grid reliability, coal and nuclear — so-called base load generators — should be paid to maintain a 90-day stockpile of fuel. Perry contends this would help prevent widespread power outages like those caused by the recent powerful hurricanes. 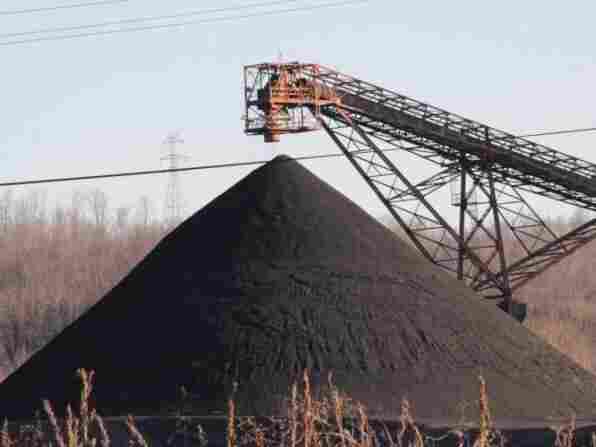 The proposal has been met with delight by the coal and nuclear industries, both of which are struggling to compete with cheaper natural gas, wind and solar. But other parts of the energy world have cried foul, predicting that such a move would "blow up energy markets" and radically reshape the U.S. electricity industry. What's it all mean, and why should I care? The power grid is like an auction. When a regional grid operator is looking for power, each generator, be it a coal plant on the edge of town or a wind farm in a different state, offers its electricity for whatever price it can make at a given time. The grid operator lines up all the bids, from the cheapest (usually wind or solar) to most expensive (often coal, gas or oil) and comes up with a cutoff price, depending on electricity demand. The grid operator dispatches electricity from all the generators with bids below that cutoff price. In recent years, cheap natural gas and renewable energy have caused that cutoff price to drop. As a result, generators that are more expensive to operate, like coal, are not being used, or are turned on and off as needed. That's not an efficient use of a coal plant, and many just cannot afford to compete in this market saturated with cheap natural gas (which can be turned off and on), wind and solar. What would this mean for coal? The coal industry and its supporters, like Perry, argue that coal and nuclear are a base load power that's needed to keep the lights on "when the wind isn't blowing or the sun isn't shining." But because coal and nuclear can't compete with cheaper (and cleaner) sources of power, they need to be subsidized. Perry also argues coal and nuclear are critical in extreme weather events, where on-site storage means power is there when it is needed. On Capitol Hill he specifically cited the 2014 "polar vortex" cold snap, although environmental groups point out that even coal plants had problems then, including frozen stockpiles of coal. In fact, the Department of Energy's own recent "grid reliability" study found the current grid is highly reliable, despite an ever decreasing amount of coal-fired generation. As the grid is further transformed there will be new challenges that have to be overcome, the report concluded. Still, as one energy commentator put it, Perry's proposal to subsidize coal and nuclear is a "solution in search of a problem." If this happens, would my electric bill go up? FERC is an independent body and doesn't have to do the Department of Energy's bidding. But at least one FERC commissioner has indicated that he believes coal should be subsidized. If the plan in some part is accepted, it would only affect electricity markets in about two-thirds of the country, those that have been restructured into regional or independent transmission organizations. And in many places, even those markets wouldn't be affected because they have little or no coal or nuclear generation (California, New York and New England, for instance). Texas won't be affected, because the state runs its own grid and is not under the jurisdiction of FERC. The part of the country that would have to deal with the most subsidies is the Mid-Atlantic region, home to the largest wholesale power market in the world. Some foresee "hundreds of applications" from distressed coal and nuclear plants, and that would be expensive. Electricity prices would go up. Some analysts believe this would threaten wholesale markets across the country. A broad coalition of strange bedfellows has come out against Perry's proposal, from renewable energy companies to the American Petroleum Institute, which lobbies on behalf of natural gas. Even some conservative groups with ties to the Trump administration describe Perry's proposal as "using a sledgehammer to swat a fly." Others note that by choosing to subsidize coal and nuclear, the Trump administration would be doing exactly what conservatives have accused the Obama administration of doing, choosing winners and losers in a free market energy economy. Still, against all odds, the Trump administration continues to push the president's agenda to save coal and reduce regulatory burdens on the fossil fuel industry. This week the Environmental Protection Agency announced it is repealing the Clean Power Plan, an Obama-era effort targeting emissions from coal-fired power plants. The renewable industry is awaiting a decision in coming weeks on whether the Trump administration will impose steep tariffs on imported solar panels. Taken together, these moves — if successful — could engineer a radical shift in direction for the U.S. energy industry. This story comes to us from Inside Energy, a public media collaboration focused on America's energy issues.